The beautiful duplexes that make up Lakeshore Village offer private backyards and attached covered parking. 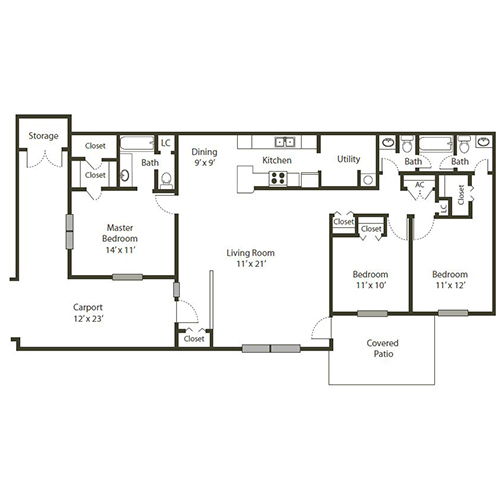 Our floor plans include two-, three-, and four-bedroom layouts so you can find the ideal space for you and your family. 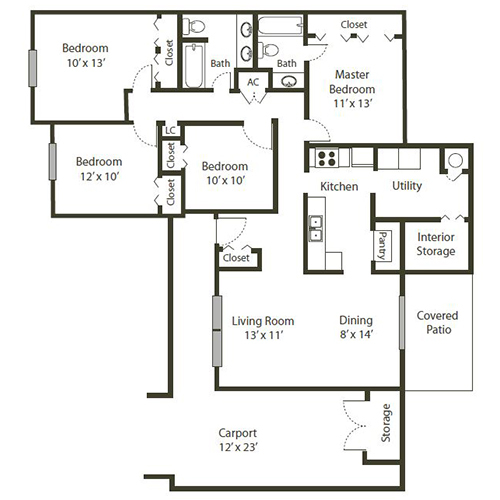 Every floor plan is open and spacious with ample closets and extra storage. 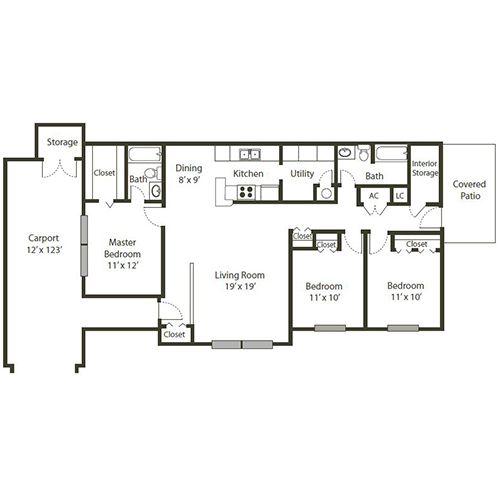 This two-bedroom floor plan includes 924 square feet of living space. The carport has a storage closet and rear entry into the utility/mud room. This apartment has a foyer with coat closet, an open living and dining area, and a galley-style kitchen. The master bedroom has three closets and shares a Jack-and-Jill-style bathroom with the guest bedroom. You’ll get 924 square feet of living space in this two-bedroom apartment. The carport includes a large storage closet. The foyer contains a coat closet and leads into the open living and dining room. The L-shaped kitchen with bar includes a utility closet with washer/dryer connections. A covered patio is located off the living room. The master bedroom has a walk-in closet and en suite bath. The second bedroom and bath are located on the opposite side of the apartment. This three-bedroom apartment has 1,151 square feet of living space. This floor plan features a carport with storage closet, an open living room, a separate dining room, and a galley-style kitchen. A large utility room is located off the kitchen. 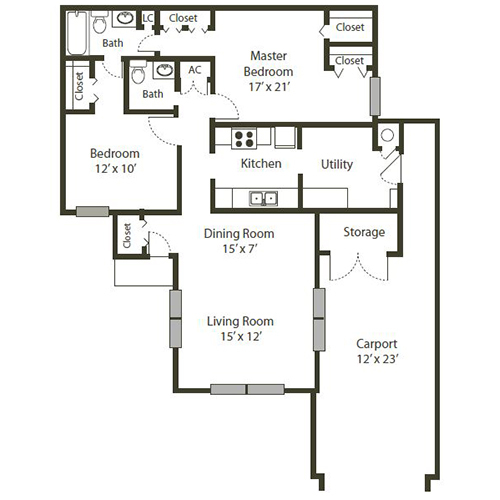 This is a split floor plan with the master bedroom on one end of the apartment and the other two bedrooms and guest bath on the opposite end. The master suite has a private bath and walk-in closet. An additional storage closet is located near the guest bathroom. The covered patio is accessible from the hallway. This 1,348-square-foot split floor plan includes a spacious living area with access to the covered patio, a separate dining room, a galley-style kitchen, and a large utility room. A storage closet is located in the carport. This apartment includes a master suite with walk-in closet and private bathroom. On the opposite side of the apartment, there are two additional bedrooms – one with private access to a Jack-and-Jill style bath that includes two water closets with a shared bathtub area. At 1,353 square feet, this four-bedroom, two-bath apartment has plenty of room for everyone. The carport includes a storage closet and walkway to the front porch/foyer. 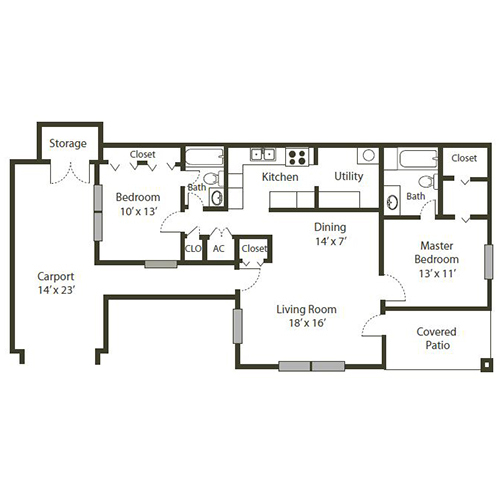 This floor plan features separate living and dining rooms, a covered patio, and a pass-through kitchen. The utility room includes a large storage closet. The master bedroom has an en suite bath, while the three additional bedrooms are located near the second bath with dual vanity.